Margaret Ann Haughton married (?) Conley. (?) Conley married Margaret Ann Haughton, daughter of Robert Henry Haughton and Hortense Kimbrough McGraw. Fannie (?) 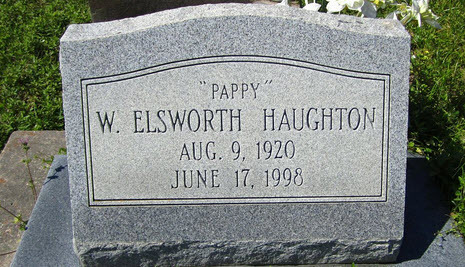 married Robert Henry Haughton, son of Patrick Henry Haughton and Ann L. (? ), in circa 1890 mar 10 y in 1900 census; 4 children born, 4 living. Dorothy Howard Calloway married Walter Elsworth Haughton, son of Henry Baker Haughton and Fannie E. Ellsworth, in Jun 14, 1948 at Mobile, Mobile Co., AL, USA. Marian "Dede" Haughton married (?) Talley. (?) Talley married Marian "Dede" Haughton, daughter of Walter Elsworth Haughton and Dorothy Howard Calloway. Andrea Talley married Robert Phelps. Robert Phelps married Andrea Talley, daughter of (?) Talley and Marian "Dede" Haughton. Michelle (?) married Chris Talley, son of (?) Talley and Marian "Dede" Haughton. Walter Elsworth Haughton married Dorothy Howard Calloway in Jun 14, 1948 at Mobile, Mobile Co., AL, USA.